This article by Beverly J. Camhe originally appeared on Fatherly. 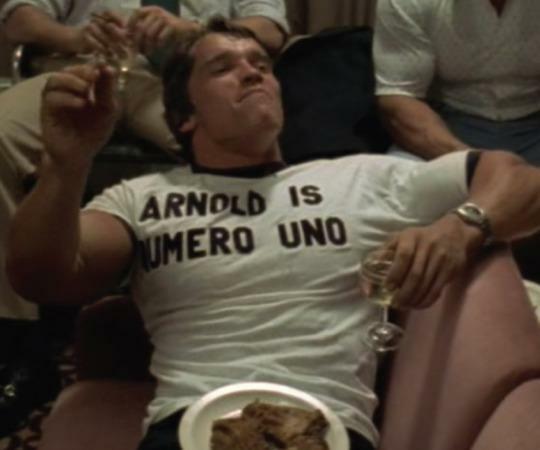 That was my pitch to Arnold Schwarzenegger as he sat having breakfast at Patrick’s Roadhouse on Pacific Coast Highway in Santa Monica with his mother. He looked up at me and said, “What is that job?” I answered, “Having a baby!” Without missing a beat, he stood up from his chair, distended his stomach, and replied, “I am the man for the job.” His mother giggled, and I almost passed out. But it was a very long “gestation” to get to that moment. I started developing the script for Junior 3 years before in 1990 with a writer friend of mine. We had both been in Jungian therapy and were searching for a way to reconcile the antagonism between the yin and the yang, a favorite Jungian question and a good theme for a movie. Then it struck us: If men could have babies, the wall would come crashing down. We did copious research and found scientific facts that could help us make this almost believable. We developed a story where 2 doctors invent a fertility drug to reduce the chances of a woman’s body rejecting an embryo. The conflict comes from the fact that they cannot do a human trial. Thus, one of the doctors decides to use it himself. As the story evolves, we come to see that at the beginning he had no intention of actually giving birth, but later he cannot let go. I knew it would take a special actor to pull that off. I just didn’t realize how hard it would be to find him. We gave birth to the script in less than 9 months, but casting the birth “daddy” took a lot longer. Hollywood was not ready for this idea. Male agents refused to give the script to their clients, and when they did we were told their actors were repulsed. However, there were 3 actors who got their yin and yang together. According to his agent, Mel Gibson was ready to do the movie until he found out that his church disapproved and thought it was an unnatural act. Woody Harrelson loved the script. He had just returned from a trip of spiritual enlightenment in Machu Picchu. Unfortunately, the studio did not think he was a big enough star. Mel Gibson was ready to do the movie until he found out that his church disapproved and thought it was an unnatural act. Then came the call from the uber agent of all agents, none other than Sue Mengers. She could deliver her client Andrew Dice Clay! After I picked myself up from the floor, I listened to her pitch: Wouldn’t women love to see this womanizer in stirrups puking his guts out — the ultimate revenge movie? Sue was not going to give up and finally convinced me to meet him. Andrew was more than prepared. He had memorized some of the script and then added his own ideas of how he visualized hysterical food cravings like eating pickles and ice cream and peanut butter all at the same time. I must say he was pretty funny, but revenge was not the theme I had in mind. The purpose of this movie was to make a positive statement of men being able to get in touch with their feminine side. This casting challenge was being played out in the landscape that gave us O.J. Simpson. I knew it would take a very secure man to do this role. Then I actually dreamed of Arnold. From the time he heard the idea, he never wavered. And his wife Maria loved this project. She believed that if men could make babies they wouldn’t make wars. 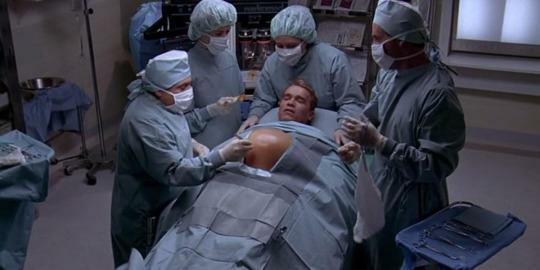 Arnold got his pal Danny DeVito and the director Ivan Reitman who’d done Twins with them, and Universal Pictures was totally behind this package. I had seen Emma Thompson in a film The Tall Man and knew how funny she could be. And I was thrilled to have my friend Judy Collins play the head of the home for unwed mothers where Arnold had to disguise himself as a 9-months-pregnant woman. 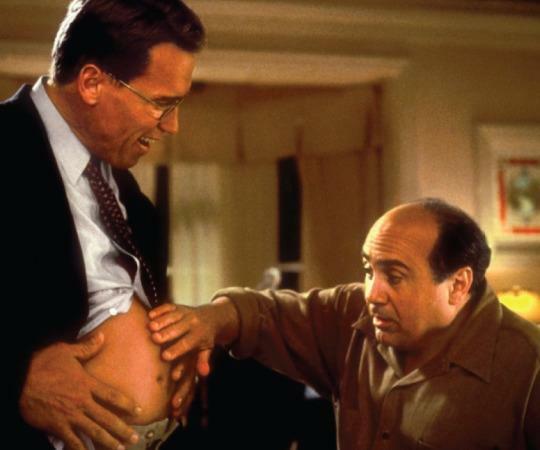 The scenes of Arnold disguised as a pregnant woman are not only hysterical but poignant as we see him relate to young women and come to understand what they all experience. The film was a total joy to make, but I was disappointed in the creative choices for the campaign. I felt the poster should have shown Arnold in drag. I used the campaign for Robin Williams in Mrs. Doubtfire as an example. The film did not perform well in the U.S. but in Europe did much better. The campaign did not shy away from what the movie was about, and European men seemed to be much more accepting and less threatened. The mayor of the city in Austria, where Arnold grew up, loved the film so much he gave him the key to the city. Many male critics in the U.S. were negative, while the rest of the world seemed to get the message and appreciate how great Arnold was. Siskel and Ebert both gave it two thumbs up — very rare for them to agree. Roger also talked about how the film explored not only the complex relationship between men and women but also the relationship between men and their own masculinity. This film was ahead of its time; genetic science was unheard of. One could view Junior now as an ironic prophecy of the changes our society has gone through — the mapping of the human genome, animal cloning, artificial intelligence, etc. But most importantly, Junior tried to define a new paradigm for the role of parenting. I think it has been finally realized. I just watched 2 Buzzfeed videos: The Try Guys Try Pregnancy Belliesand The Try Guys Change Dirty Diapers. They got 9,952,802 views. Now, to think there is actually a site where men can come together and celebrate their roles as fathers. Junior could not have predicted Fatherly! Jung can finally rest in piece. Beverly J. Camhe is a writer and producer known for films Junior, The Package, and The Believers.